Save $20 by booking online now! Same and next day appointments available! 1. Call today or click any "Book Now" button to set up your easy junk removal appointment! 2. We'll be there on time! We'll even give you a call to let you know when we're headed your way. 3. Just show us what you want us to take and we'll give you a free quote up front - no bait and switch! 4. We'll get your items from wherever they're located, whether that's the garage, attic, or crawl space! 5. We'll double check to make sure we got everything and we'll even sweep up the area! 6. Easily settle up with cash, card, or check, and wave goodbye to your junk for good! Save $20 BOOK ONLINE NOW! The BEST junk removal service in Huntington Beach! We service the Huntington Beach area including Westminster, Garden Grove, Santa Ana, Fountain Valley, Irvine, Orange, Newport Beach, and Costa Mesa. We're capable and equipped. 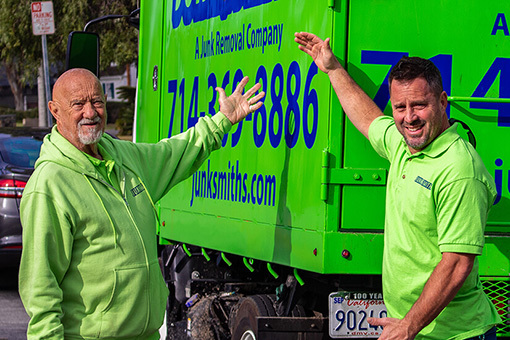 Junk Smiths team members are professionally trained, uniformed junk removal experts. We're focused on customer service, and we've got both the attitude and the tools to get your job done right. We're local! Junk Smiths is a 100% locally owned junk removal company, not a big, out-of-state franchise. When you choose Junk Smiths, you're choosing to support your local community! Because we believe in treating you how we'd want to be treated. Junk Smiths is absolutely committed to providing the best customer service in the industry. We'll get to you within 24 hours, give you up-front prices with no hidden fees, and get your job done with a smile - every time.